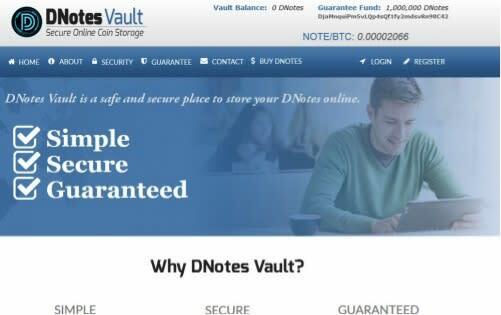 ILLINOIS, USA / ACCESSWIRE / December 13, 2014 / DNotes, the most stable, and one of Coinmarketcap’s top 50 cryptocurrencies, launched DNotesVault today in its systematic pursuit of mass consumer and merchant adoption. Just six months ago, the same team created and launched CryptoMoms, a currency neutral site dedicated to encourage and assist women to participate in the emerging cryptocurrency world currently dominated by men. Co founder, Alan Yong, pointed out that "It is easier to open a DNotesVault account than a bank account. It is also secure. We guarantee 100% of your deposit through a separate cold storage account, secured in a different location, with an amount always in excess of the total deposit. The guaranteed funds are verifiable any time through the blockchain." "Timed Send" is a scheduled installment payment, with a defined amount for each payment based on scheduled frequencies in terms of days, weeks, months, or years. This is a very useful tool for charity fund raising using DNotes, avoiding stakeholders fear of an instant dump, negatively affecting the value of their holdings. Timed Send is also a great way to manage wealth transfer with the comfort that the inheritance will not be burnt up quickly. Yong, a well regarded pioneer and visionary in the early generations of portable computers and wireless communication, went on to say that "Until DNotes becomes a truly valuable digital currency in our space, many may not understand or appreciate the DNotes' approach in building fundamental values". He is convinced that DNotesVault has a major strategic significance. Among various objectives, DNotesVault will be creatively utilized to build the next generation of DNotes stakeholder using CR.I.S.P. for kids and CR.I.S.P. for students to be followed by many more. Yong stressed that "The beauty of DNotesVault is that we can setup and launch a new plan or program, such as a charity fund raising, in no time".